Half-Life и Adrenaline Gamer форум • Просмотр темы - Spectator mod ? Заголовок сообщения: Re: Spectator mod ? bcz this cod up give me only msg print when i set it i = 0 and dont work to spawn players in this bug ! Ok, yes, the problem exists if client is just started (HUD never initialized). Not sure what leads to that. 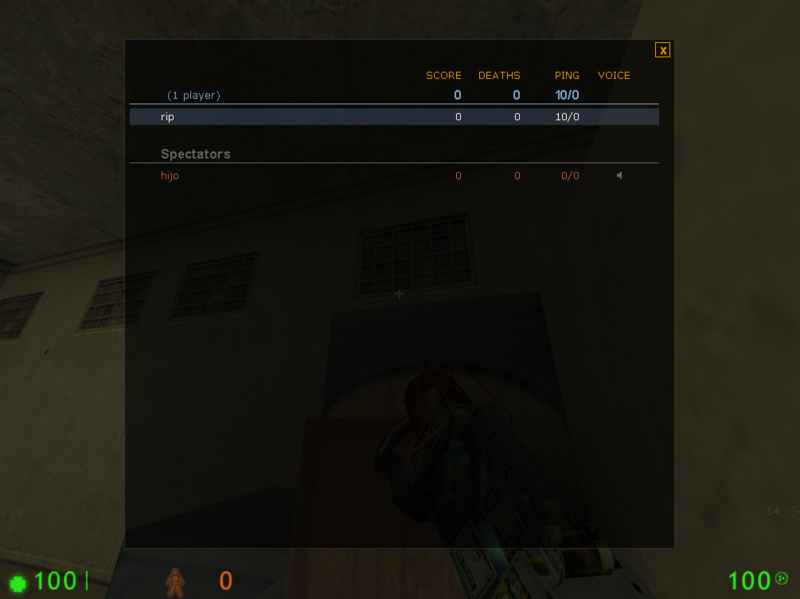 I think HUD reset and init messages do not arrive to the client if toggle to spectator happen in putinserver. Dunno if that is AMXX or engine problem. Lev, I have trace the function where the problem begins, it's caused by RemoveAllItems(), don't know exactly why, but if you remove this, then the issues with scoreboard are gone when you set user spectator in putinserver. Honestly can't recall what the problem was. Do you suggest just not to call RemoveAllItems when function is called from PutInServer? Maybe I have track the issue in InitHUD, from StartObserver->RemoveAllItems->UpdateClientData->InitHUD, I notice that it never calls SendMOTDToClient. I suppose MOTD shouldn't be related to bugs in Score Panel. BTW Do you testing on BugfixedHL client.dll? I think I fixed some Score Panel bugs there. Yes I do, but I'm afraid the problem is from server-side, somethings is blocking it, (maybe InitHUD). You can manage to send yourself the messages to the player to soften the issue (GameTitle, TeamInfo, etc), but right now the problem I had is that you can't send bots to spectator, at least in putinserver. It doesn't work with "spectate" and it doens't work with my implementation (Invalid Private Data), also you can't block their spawn. I use RCBOT, but as far I remember, this also happens with JKBotti. If you can give some test plugin to reproduce the issue with JKBotti I can take a look at it. Using my set_user_spectator() implementation (AMXX 1.9 or newer required).